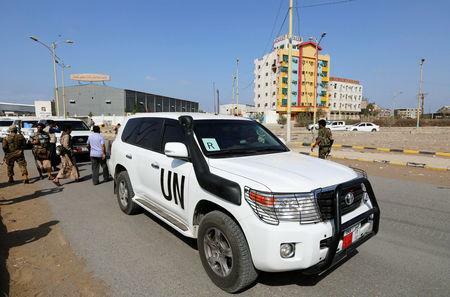 ADEN (Reuters) - The U.S. ambassador to Yemen blamed the Iran-aligned Houthi movement on Thursday for the hold-up to a U.N.-led peace deal in the main port of Hodeidah and said Houthi weapons pose a threat to other countries in the region. The Saudi-backed Yemeni government and the Houthis reached a ceasefire and troop pullout deal for Hodeidah, which is under Houthi control, at talks in Sweden in December. The pact was the first big breakthrough in efforts to end Yemen's four-year war. While the truce has largely held, the troop withdrawal by both parties has not materialized with each side blaming the other for lack of progress. The deal aimed to avert a full-scale assault on the port, a lifeline for millions of Yemenis. "We are greatly frustrated by what we see as delays and stalling on the part of the Houthis in implementing what they agreed to in Sweden, but I have great confidence in the UN envoy and what he is doing," Ambassador Matthew Tueller told a televised news conference in the southern port of Aden, where the internationally recognized government is based. "We are willing to work with others in order to try to implement these (Sweden) agreements and see whether the Houthis can in fact demonstrate a political maturity and start to serve the interests of Yemen rather than acting on behalf of those who seek to weaken and destroy Yemen," he said. Tueller said he had not given up hope that the deal would be implemented in Hodeidah, where thousands of Yemeni forces backed by the Saudi-led coalition are massed on the outskirts. A Houthi politburo official, Mohammed al-Bukhaiti, accused the Western-backed coalition of trying to undermine the accord. "America and its agents...only accepted a partial truce, in Hodeidah, due to international pressure over Khashoggi," he told Reuters, referring to the murder of Saudi journalist Jamal Khashoggi at the kingdom's Istanbul consulate last year. Tens of thousands of people have been killed in the war, which pits the Houthis against other Yemeni factions backed by the Saudi-led coalition and loyal to the government of Abd-Rabbu Mansour Hadi. The Houthis ousted Hadi's government from power in the capital Sanaa in late 2014. The conflict is widely seen in the region as a proxy war between Saudi Arabia and Iran. The Houthis, who control Sanaa and most population centers, deny being puppets of Tehran and say their revolution is against corruption. The Sunni Muslim coalition twice tried to seize the port last year in a bid to cut off the Houthis' main supply line. The United Nations fears a full-on offensive may disrupt operations at the port, which handles the bulk of Yemen's imports, and trigger mass starvation. The alliance accuses Iran of smuggling weapons, including missiles which have targeted Saudi cities, to the Houthis. The group and Tehran deny the accusations. Tueller said the United States was working with Yemeni authorities to prevent arms smuggling from Iran and to strengthen local institutions. "The fact that there are groups that have weapons, including heavy weapons and even weapons that can threaten neighboring countries, and those weapons are not under the control of the institutions of the state - this is a severe danger to the region as well as to Yemen," he said. 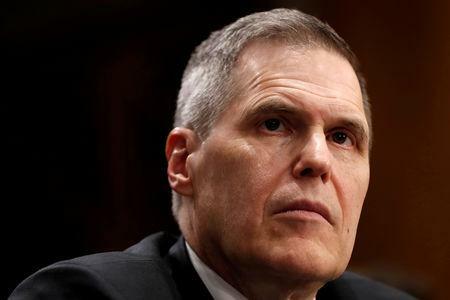 The United States does not support groups that "seek to divide Yemen", Tueller said, in an apparent reference to southern separatists whose forces have been taking part in coalition operations under the leadership of the UAE. The complex war has revived old strains between North and South Yemen, formerly separate countries which united into a single state in 1990. A separatist leader warned this month that any peace deal that fails to address the south’s wish for self-determination could trigger a new conflict.